You might remember that Planet Four is available in traditional and simplified character Chinese, but did you know the site is also available in German and Magyar(Hungarian)? We wanted to share a little bit more about some of the people who’ve helped make these translations possible. Ning Ding is a Ph.D candidate of China University of Geosciences (Wuhan) major in structure geology.She is mainly interested in the central uplifts of Martian impact craters and comparative planetology. She was a visiting student in HiRISE team in the US where she knew the Planet Four and participated in Chinese translation the website. My name is Lukas Hackl. I am from Austria and working for an IT company. I am interested in Astronomy, Photography, Motorcycle and other science. I like to be part of researches and help scientists around the world. Mein Name ist Lukas Hackl. Ich komme aus Österreich und arbeite für eine IT-Firma. Ich interessiere mich für Astronomie, Fotografie, Motorrad und andere Wissenschaften. Es gefällt mir Teil von Forschungen zu sein und Wissenschaftlern auf der ganzen Welt helfen zu können. 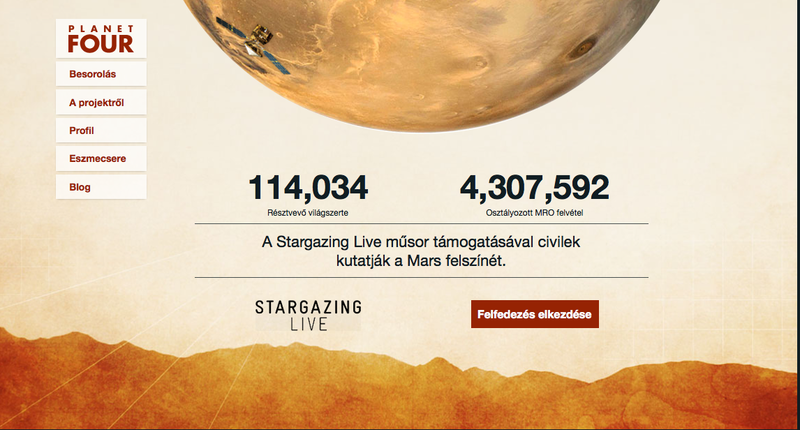 So, I’m an Application Specialist in a Hungarian software company and a beginner amateur astronomer. I’m participated in numerous Zooniverse projects and I think it is a great way to help science and scientist in their works. I have only one bigger experience in translating, I was one of the Hungarian translators of Chess.com. I’m interested in sports, chess, stars and environment defense. Alkalmazástechnikai szakember vagyok egy magyar szoftvervállalatnál illetve kezdő amatőrcsillagász. Több Zooniverse projektben is részt veszek, szerintem ez egy hatalmas lehetőség a tudomány és tudósok segítésére. Jelentősebb fordítói tapasztalatom eddig a Chess.com magyarítása volt, itt egy voltam a többi fordító között. Érdekel a sport, a sakk, a csillagok és a környezetvédelem. Are you interested in helping translate Planet Four into other languages? Find out more here on how to join the effort. I am a software engineer at ASIAA, born and raised in the north-east of China. 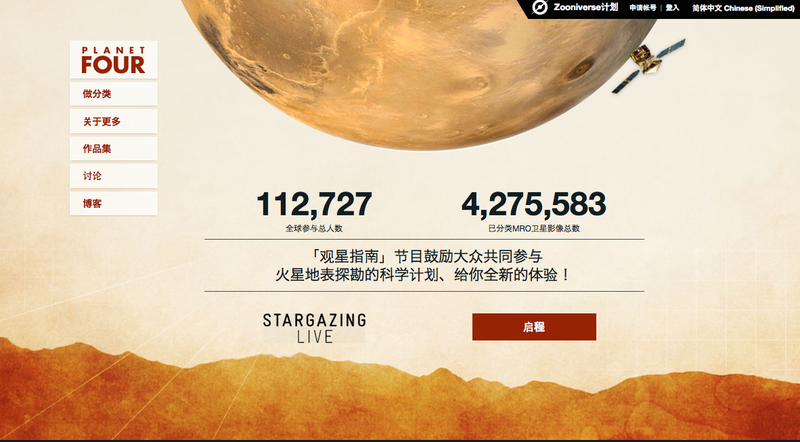 It has been my pleasure to participate in the translating efforts the Planet Four website to simplified Chinese. During the Citizen Science workshop organized by Meg in March 2014 at ASIAA, I learned that many people worldwide are joining this great project in their spare time to help out scientists. However, there are not many people participating from China yet. The main reason of this is the availability of the information, as there was no Simplified Chinese site available. 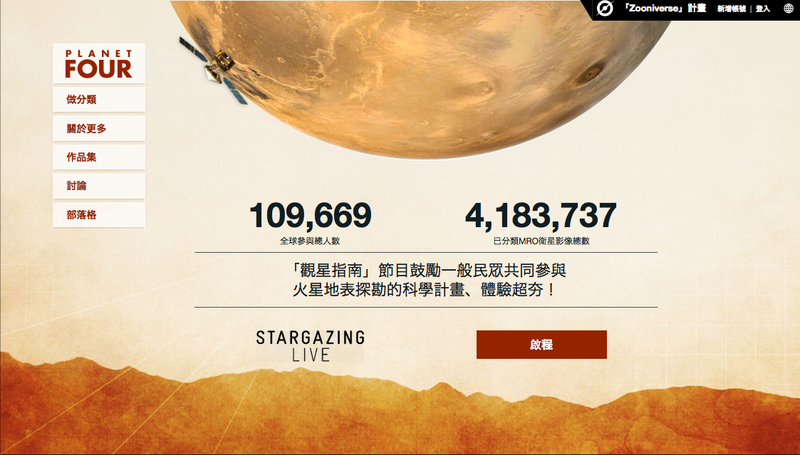 The simplified Chinese version of Planet Four provides a perfect opportunity for people in China to join the exciting cutting-edge project to enjoy and experience the amazing images of Mars. Welcome to Planet Four, a citizen science project designed to help planetary scientists identify and measure features on the surface of Mars . . . the likes of which don’t exist on Earth. All of the images on this site depict the southern polar region, an area of Mars that we know little about, and the majority of which have never been seen by human eyes before! 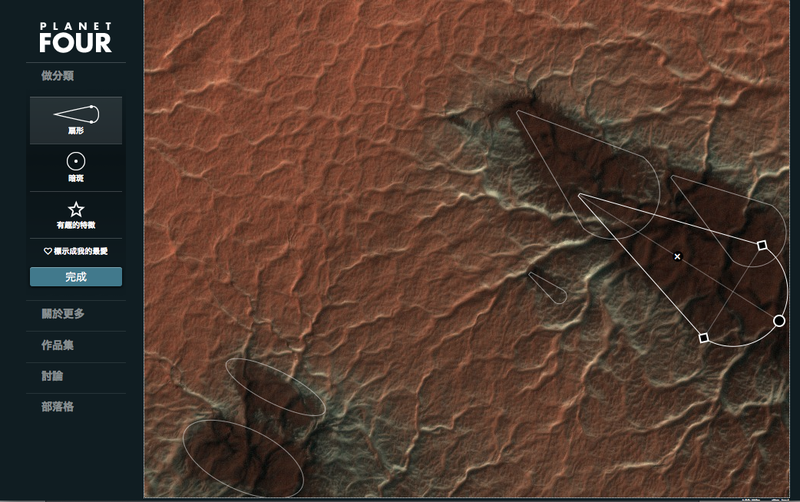 We need your help to find and mark ‘fans’ and ‘blotches’ on the Martian surface. Scientists believe that these features indicate wind direction and speed. By tracking ‘fans’ and ‘blotches’ over the course of several Martian years to see how they form, evolve, disappear and reform, we can help planetary scientists better understand Mars’ climate. We also hope to find out if these features form in the same spot each year and also learn how they change. There are far too many images for a group of scientists to get through alone and computers are just no good at detecting the features we are trying to mark. The human mind is far superior at analyzing images with the complexity of the Martian surface! Your markings will be collected together with the markings made by other volunteers on that same image. Taking an average of these markings, we will produce an extremely reliable map of the ‘fan,’ and ‘blotch’ features on the surface of Mars and the first large scale measurement of wind on the planet. 歡迎光臨第四行星！We’re pleased to announce that Planet Four has been translated to traditional character Chinese thanks to the Education and Public Outreach (EPO) office at Academia Sinica’s Institute of Astronomy & Astrophysics (ASIAA). A big thank you to Lauren Huang for translating and Mei-Yin Chou for verifying the translation. I’m a postdoctoral fellow at ASIAA and Lauren, Mei-Yin, and I will be introducing Planet Four and the new translation to educators from around Taiwan at a teacher workshop on March 2nd as part of a larger workshop on Citizen Science in Astronomy hosted at ASIAA from March 3-7th. Michael and I will both be attending the full workshop as well. Also many thanks to the Zooniverse’s Chris Snyder for getting all the technical things set up for the translation to go live on the site in time for the teacher workshop, and thank you to the Zooniverse’s Rob Simpson and Michael Parish for their help as well. Are you interested in helping translate Planet Four into other languages? Find out more here. What follows is the announcement from ASIAA, in English and then in traditional characte Chinese regarding the new Planet Four translation. We need your help to explore Mars. On Planet Four (http://www.planetfour.org/?lang=zh_tw), you will be shown images of the South Pole of Mars taken by the HiRISE camera aboard the Mars Reconnaissance Orbiter. We are asking you to mark dark fans and dark blotches that appear and disappear during the Spring and Summer on the South Pole of Mars. During the winter carbon dioxide (CO2) condenses from the atmosphere onto the ground and forms the seasonal ice sheet. The ice begins to sublimate in the spring, and the seasonal cap retreats. The dark fans and blotches begin to appear in the Southern spring when the ice cap begins to thaw and sublimate back into the atmosphere. The fans and blotches then disappear at the end of the summer when there is no more ice left. We want to study how these fans form, how they repeat from Spring to Spring and also what they tell us about the surface winds on the South Pole. If the fans are places where the wind is blowing, then they tell us the direction and the strength of the wind. Blotches then tell us where there is no wind. This is a task that computers cannot do, but which humans are really good at. We need to collect together many people’s markings and combine the results to be able identify the fans and blotches in the HiRISE. With your help mapping the seasonal fans and blotches, we can better study and understand the Martian climate. 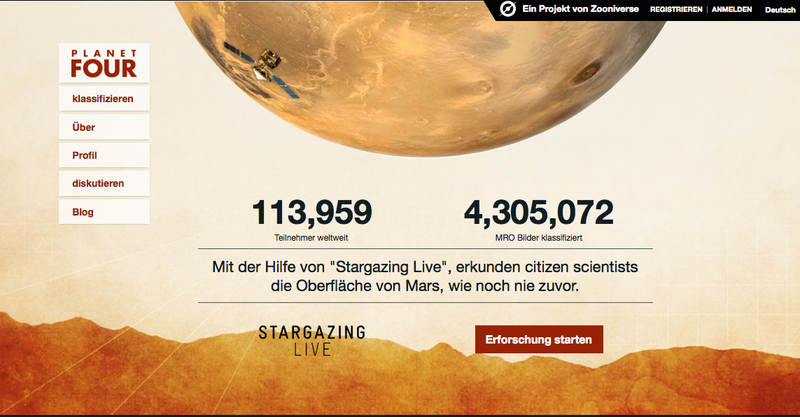 Explore Mars today at http://www.planetfour.org/?lang=zh_tw! As planetary scientists delight in seeing their probes launched into space, now that the Chinese translation of the Planet Four website is finished, we are also excited for more new volunteers from our own country are about to join this project! Either by way of a probe or a newly added translated language, the two things is similar: opening up a gate to a new world always makes us feel great! Meg asked me to say a few things as to “why I translate the website for Planet Four”. Of course, the number one motive is serving the community! During the translating process, I constantly thought about the participants of zooniverse, that they are voluntarily doing this, offering their time and resource to support science research; it is our duty to put things in clear Chinese with correct science, so that our helpers can enjoy their science quests with pleasure. However, this task is not easy and is impossible if without my colleague’s help! I’d like to thank Dr. Mei-Yin Chou greatly, who helped verifying each paragraph throughout the site. Chinese proverb says “one step back, a broaden sky” (退一步海闊天空). I guess whenever people have the time to log in this Planet Four website, it could be a time set aside as a retreat designated of Mars exploration. We are all curious to know more about the fourth planet of our solar system and can’t wait to see how the wind blows there! Have fun!